Love snowmobiling? Want to make the most of what’s left of winter to get out into the fluffy stuff? We’re here for you with 10 suggestions for snowmobile adventures that will put the wind in your sails. There’s something for everyone: short loops and long circuits, easy cruising and adrenaline rushes, and of course, plenty of nature. If you’re rarin’ to get outside, read on! Feel like exploring the Québec City region the with your sled? Take a day and head out to the Laurentides nature reserve (Réserve faunique des Laurentides). Leaving from the junction between Trail 3 and Trail 369, make your way north on the 369, which runs along the edge of Montmorency forest and Jacques Cartier National Park. Although snowmobiles aren’t allowed inside either the park or the research forest, you can stop at the Montmorency snowmobile chalet to warm up and have a bite to eat. Take Trail 23 for the return trip southward. There are a few places to eat and stay near Saint-Raymond. You could even take Trail 73 all the way to Station Duchesnay and spend the night. With their spa and the many activities available on site, it’s a nice way to turn your snowmobile outing into a relaxing weekend. This ride can be combined with the Québec City getaway described above that ends up near Saint Raymond. It runs through little villages in Portneuf, Québec City, and Mauricie regions and winds up in Saint-Augustin-de-Desmaures. Stopping points along the way include Rivière-à-Pierre, Montauban, and Saint-Casimir, to name just a few. Be sure to hit up one of the local microbreweries, like Les Grands Bois in Saint-Casimir or L’Esprit de clocher à Neuville. While you’re there, why not take it easy and spend the night in a nearby inn? Feel like getting off the beaten track? Sounds like the Monts Valin Massif in the Saguenay−Lac-Saint-Jean is for you. Follow the marked routes or challenge yourself on trails that are more like back country runs. You can also do the famous Sommets circuit, which covers virtually the entire highlands. There’s weeks’ worth of terrain out there, so stay a few days! You’ll find plenty of accommodation, restaurants, and rest stops. For more information and help with planning your trip, read “Snowmobilers Paradise” on the Saguenay−Lac-Saint-Jean tourism website. If you like long distances and gorgeous scenery, the Abitibi-Témiscamingue region is for you! This is a region with great winter conditions and 3,500 km of trails. With all the breathtaking winter scenery, some say they’re among the prettiest in the world. Feeling ambitious? The 1,500 km Grande tournée blanche circuit is made for riders who aren’t afraid of long distances and are eager to discover the wild beauty of the region. It’s like a grand tour of the Abitibi with a short excursion into northern Québec. 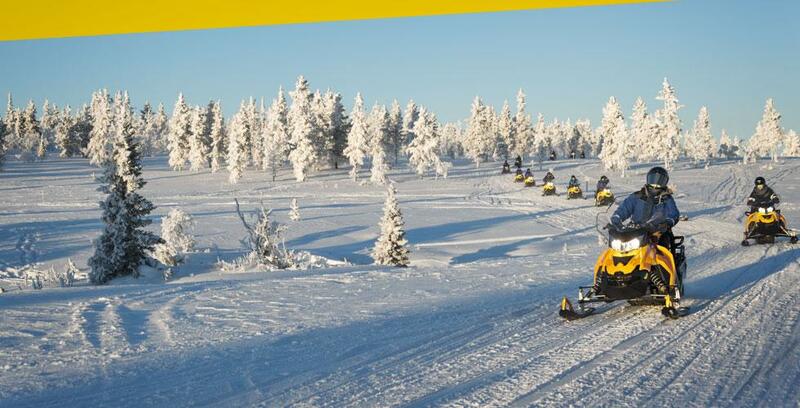 To plan your trip, visit the Snowmobiling page of the Tourisme Abitibi-Témiscamingue website. Like the Abitibi, the Outaouais region is great for long rides. With over 2,000 km of trails winding through mountains, valleys, woods, and lakes, it’s an ideal destination for anyone looking to enjoy the great outdoors. There are plenty of gorgeous routes to choose from, including the Great White North in the Gatineau Valley. This 4 day, 3 night ride is featured on the Tourisme Outaouais website, where you’ll find great tips on where to eat and where to stay. They don’t call the Lanaudière region “snowmobiling country” for nothing. With 4,800 km of trails, this place has it all: mountains, rivers, lakes, and forests in abundance. We recommend the 370 km Du Fleuve aux Montagnes route, which will give you a taste of everything this region has to offer. Leaving from Berthierville, you’ll travel from the St. Lawrence River to the mountains, including Black Mountain (La Montagne Noire). It’s the highest summit in the region, so if the weather’s right you’ll have a great view for miles around. Need more information? Visit Tourisme Lanaudière’s Pays de la motoneige website. It’s got all the information you need and suggestions for other rides, like the Lac Taureau loop or the traditional Saint-Donat/Saint-Michel. Ride along Trails 521 and 542 and the local trails to explore magnificent Coaticook Gorge Park. This is a nice little ride that can easily be done as a family and combined with other activities: snowshoeing, ice climbing, yukigassen, and a cozy break at the rest stop. If you’re in the mood—and warm enough—why not fight ice with ice at Laiterie Coaticook by sampling one of their legendary ice cream cones? As an apple growing community, the Municipality of Rougemont gets lots of visitors in the fall. But it’s just as beautiful in the winter, with the snow covered orchards and famous Mount Rougemont Hill, one of the nine Monteregian Hills. We recommend taking Trails 505 and 510 and some of the local trails to explore nearby villages like Saint-Damasse, Marieville, and Saint-Césaire. It’s a nice scenic ride that will give you a real feel for the area. While you’re in the area, stop in at the Jodoin Cider House to visit their facilities and stock up on delicious cider, if you have room. If you prefer beer, you’ll want to end the day in Farnham at the Farnham Microbrewery. Although snowmobiling is banned on Montreal Island, you can ride some of the surrounding islands, including Île Bizard and Île Perrot. We recommend starting in Vaudreuil-Dorion and riding across the two islands all the way to Pointe Calumet. With this route you’ll get to ride on narrow trails, along the shores of the Ottawa River, and across the Lake of Deux-Montagnes. Plus, it has some killer views of Montréal. For the last adventure on our list, we suggest heading from Saint-Eustache all the way to Mont Tremblant, passing through the surrounding towns on your way back. You could even stop and spend a night somewhere in the Laurentians and come back the following day. It’s a lovely ride through the mountains and villages of the Canadian Shield. Be sure to pop into some of the villages on the route. It’s the kind of region where you’ll want to take your time, relax, and enjoy the scenery. By now, you should have some great ideas for making the most of winter—or what’s left of it—on your snowmobile. For more details on routes, the interactive trail map on the FCMQ website is a great tool for planning your rides. ALast words of advice: make sure the trails are open, your sled’s in good condition, and you have valid insurance. And of course, stay safe and follow the rules.